With Tim Burton’s marvellous Charlie and the Chocolate Factory dazzling audiences all over the world, interest is mounting in his back catalogue. For starters, there’s the freaky Beetlejuice (’88), Batman (’87) and the fabulous Edward Scissorhands (’90). But for a really early pet project, you should check out The Nightmare Before Christmas, written and illustrated by Burton while he was an employee at Disney. This Oscar nominated, stop-frame animated musical was conceived by Burton as a cheeky response to the famous Clement Clarke Moore poem and he turns the tale on its head by following the fate of a hollow-eyed, skeletal, stick creature named Jack Skellington. 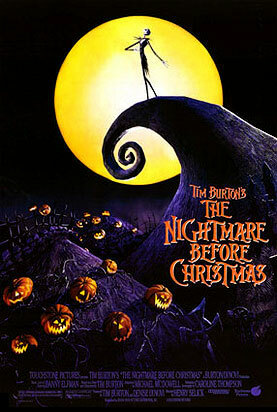 Affectionately hailed by his ghoulish subjects as The Pumpkin King, Jack is the driving force behind Halloween. But this year, Jack returns to his spooky realm after yet another triumphant annual celebration with the overwhelming feeling that something is missing. Oblivious to the yearning desire of a raggedy doll called Sally – the prize creation of a wheelchair bound Evil Scientist – Jack wanders into a forest where he stumbles through a portal into Christmas World. The wholesome sight he beholds strikes joy in his very soul and he vows then and there to abandon his boring old ritual and appropriate Christmas instead. With the help of his kooky disciples, he kidnaps Santa who is then held prisoner by the Oogie Boogie man, a hessian sack full of bile with a wicked sense of rhythm. Meanwhile Jack, dressed in a Santa suit that Sally has stitched up for him, is busy distributing presents down chimneys. But his generous gifts of shrunken heads and other abominations terrify the children right out of their tiny minds. It’s a devilish conceit and while Burton couldn’t direct the film due to his commitments on the Batman sequel, it has his stamp all over it. Burton’s former Disney colleague Henry Selick was enlisted to bring his vision to the screen and composer Danny Elfman, a long time collaborator of Burton’s, provided the music as well as the singing voice of Jack. The Special Edition DVD also contains Burton’s debut animation Vincent (’82) – a six minute gem narrated by Vincent Price; and his hilarious live action debut Frankenweenie (’84). So if you were impressed by his Wonka remake, delve back to where it all began, and witness how Burton’s singular vision evolved.